One pan meals are my absolute favorites for busy weeknight cooking, and this baked salmon fits that requirement perfectly! Anything that can go in a skillet or on a baking pan and include protein and vegetables or starch is a win for me, like this Skillet Mexican Chicken and Rice. If it’s just David and me we usually eschew a starch anyway but many one pan meals could include sliced potatoes on the same pan if you wanted that. 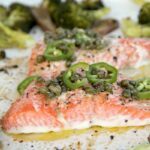 I’m always looking for easy baked salmon recipes and when I saw this recipe for Roast Salmon and Broccoli with Chile-Caper Vinaigrette last year in Bon Appetit magazine, I knew it would be on my regular rotation. We try to eat a lot of fish, and roasted vegetables are the bomb. The original recipe calls for broccoli but you could use any vegetable with a similar roasting time: cauliflower, Brussels sprouts, onions, thinly sliced carrots…many possibilities! I added some sliced baby eggplant and made a few other changes and it was perfect. What’s your favorite one-pan meal? Leave a note in the comments! 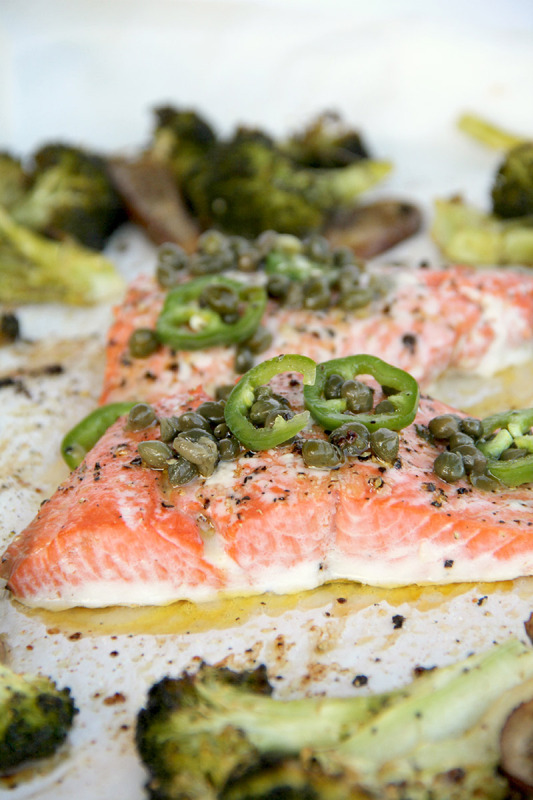 This baked salmon with vegetables and a chile-caper vinaigrette is a quick and easy one-pan meal for a busy weeknight dinner. Preheat oven to 400. Line baking sheet with parchment paper. Toss vegetables and 2 tablespoons oil on baking sheet and season with salt and pepper. Roast vegetables about 12 minutes. Drizzle salmon with 1 tablespoon oil and season with salt and pepper. Push vegetables to edges of baking pan and add salmon to center of pan. 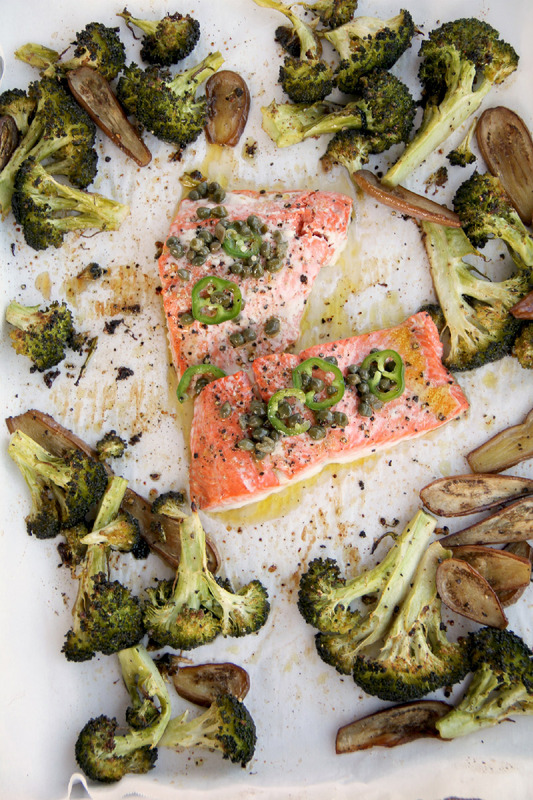 Roast until salmon is opaque and vegetables are tender, 10-15 minutes. While salmon is roasting, combine jalapeño slices, vinegar, honey, and a pinch of salt in a small bowl and allow to sit for 10 minutes. Mix in capers and 2 tablespoons oil, season with salt and pepper, and stir until well blended. Plate salmon and vegetables and drizzle with vinaigrette.